I'm new to su podium and I noticed the caustics almost always look pretty bad, and the lack of tutorials made me make one myself. I've lately worked a bit to understand the nature of caustics in su podium, and came with results. To make caustics look better in podium you'll need to edit some values in one of your presets. I'll try to explain these values the best I can, though some of them are still unclear to me. If there's someone who has got a better understanding of these values, I hope they'll share their secrets. I read the preset guide, but it was, unfortunately, very lacking. var __cphotons: increases the amount of photons and decreases their size. The bigger value, the better outcome. Greatly affects the performance. 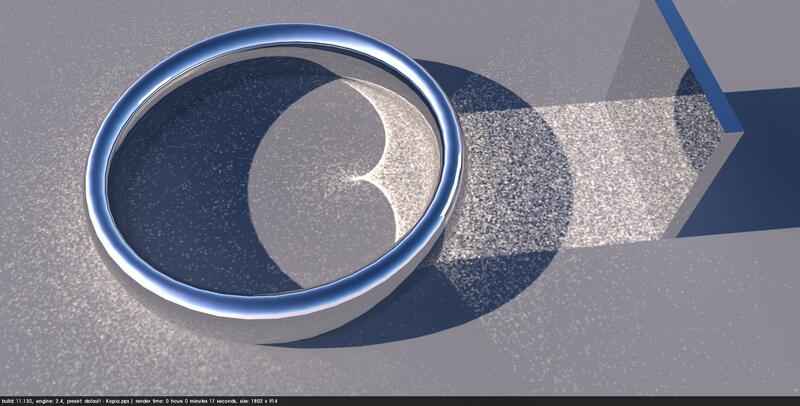 If you're aiming for a scene with very soft caustics, and want them to be quick, turn it to -30 and set cmult to 2.
var __cN, blurs the photons. Increasing the value makes things less blotchy, but also impacts the performance. var __cmult, increases intensivity of the light. Has no effect on the performance. var __csteps, Can't really tell what it does. Changing the values showed no difference in the outcome. Has no effect on the performance. 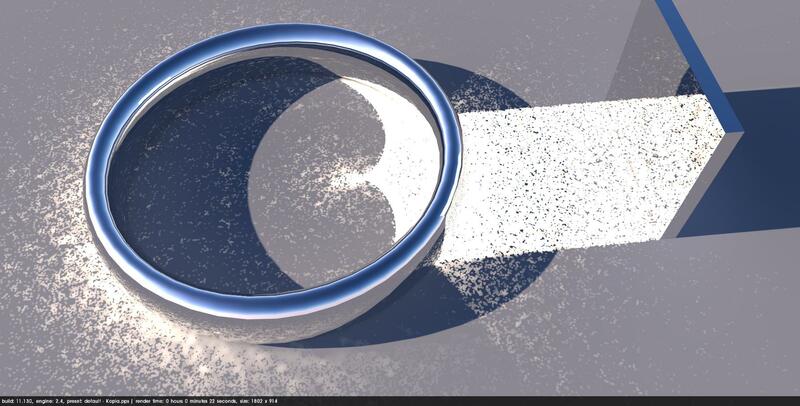 var __clow, higher value increases the blur on photons, setting it to 0 removes the blur from edges of reflected light. Has some impact on the performance. Lower values merge the photons into 'blotches'. The best result I could come up with without a great impact on the performance. It's pretty accurate and rather smooth. Camera tracing takes a very long time, unfortunately. And the blotches are still there. Wow. I have to try this out. BTW - the next upgrade is Version 2Plus and it has a Preset Editor which will make editing presets a bit simpler. Thanks for testing these! 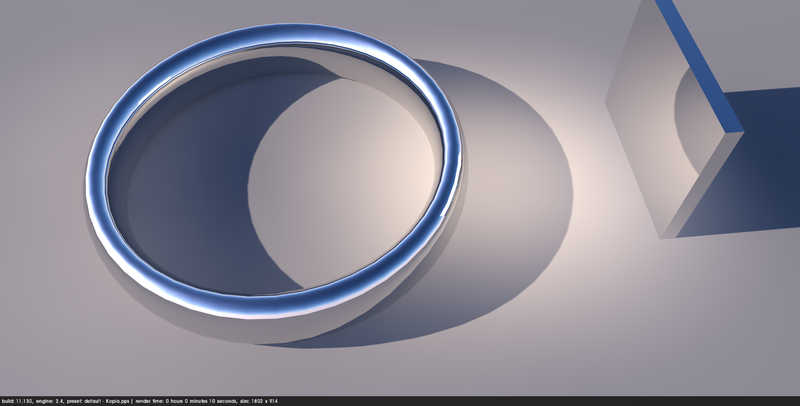 As you have seen, I haven't spent much time tweaking caustics, because the results I had in my tests with the default values were all better than yours with the standard presets. However, it does show how results can vary a lot from one scene to another. This is the critical thing, because caustics seem to be much more sensitive to different values than photons. It's rather old now, and doesn't relate precisely to the Podium variables, but the the principles remain the same. The variable cLow is equivalent to the Radius value, and cHigh is the Max value. We do have some newer presets with the next version of Podium that improve caustics. Oh, that's good to know. I don't really understand how the options work, it was just a tedious, long experiment of changing every value and see how things respond. The manual you posted made some things clearer, but still, I'm pretty far from satisfying results. I can't wait for the next version of Podium. I'd love to see the autophotons mentioned in the manual too. I thought autophotons were configured, but I'm not so sure now. So, yeah, I know exactly how tedious this process is! Copying a random post from another, by accident my thread, and posting it somewhere else. What are you trying to achieve? If you post some spam, you will get banned.